BareSkin® dries 2 - 3 time faster then other materials. Sand dose not stick to the BareSkin® towel (unlike other materials). 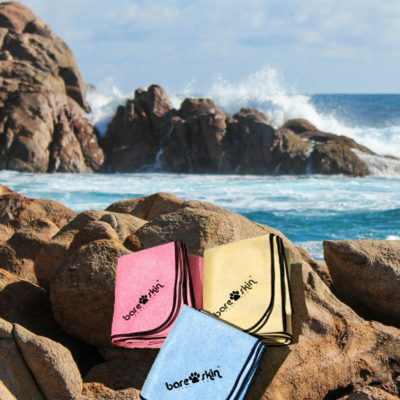 BareSkin® towels are EASY to clean - simply wash and dry. Some of the other materials require ammonia to clean. 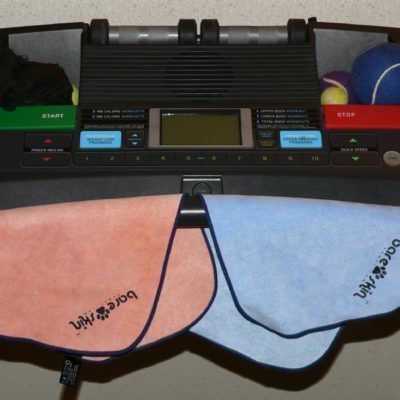 Our towel even gets softer with every wash! BareSkin® will absorb 3 times it’s weight in water. As with a true chamois, simply wring out and continue to use - it works whether we to dry! Other materials saturate quickly and once wet, are not longer usable. 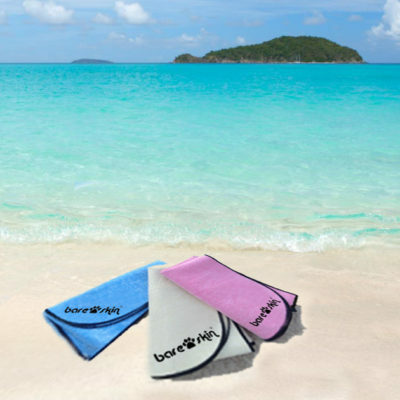 BareSkin® is highly packable - our Beach towel folds from 34”x58” to 4”x6”. Two folded Beach towels will fit in a small 2-drink cooler! BareSkin® is energy efficient and lint free - it will dry quicker and will less energy in driers. Orders ship for a flat rate of $7 - FREE STANDARD SHIPPING on orders over $100! Orders are normally sent via USPS. if you require express delivery, the standard express shipping fees apply. Wholesale inquiries are welcome! Please email us at info@bareskintowel.com. All orders are processed within 2 business days and are shipped via USPS (allow 3-5 business days for delivery with standard shipping). Overnight shipping is available at a rush fee of $20 plus any UPS/FedEx shipping fees. Insurance is covered by standard shipping/handling and signature delivery is available as an additional expense upon request. Customer is responsible for providing accurate and safe delivery address. BareSkin® is not responsible for packages successfully delivered by USPS, UPS or FedEx, signed or not. Only unused product with a manufacturer defect is eligible for return and all requests for returns must be received within 30 days of the purchase date. Requests for unused product to be exchanged for another size or color must be received within 30 days of the purchase date. Any reimbursement or credit will be based on the original billed amount less shipping charges. Used product is not eligible for a return or exchange at any time. BareSkin® reserves the right to determine upon return if product has been used and is eligible for reimbursement. Contact us for a return address and RMA number. You will be credited via the original method of payment within 30 days of receipt of the returned product. Shipping and handling are not refundable. Additional information may be obtained by contacting us. We will respond to all requests for information within 2 business days. Please note this policy may be revised or updated at any time without prior notification.